If you live dream and sleep Social Media, BusinessBlogging is the place you should be working at. At Business Blogging, we’ve openings for Content Writers, Social Media Evangelists and SEO Analysts. You’ll have an opportunity of working with a team of passionate individuals and some of the best clients. More details will be out soon. We also welcome students who’d like to intern with us. After making its mark in smartphones market, Android is entering netbooks and laptops. Priced afford-ably at 15 K, acer netbook has 140GB HDD, windows XP, 1GB ram, intel Atom processor. Read a complete review of Acer Android netbook here. If you’re using one, do give your feedback. 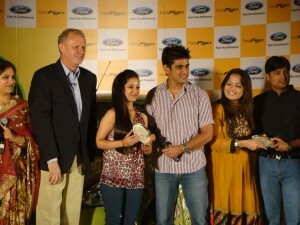 Ford Figo’s 50000th car, that toured all of India during October 2010, has helpd company raise Rs 20 lakhs for charity. The Discover Smart Drive saw its grand finale in Chennai today, wherein press was invited to share the success story. ”The Discover Smart Drive has helped us connect and thank consumers across India. The Figo has achieved outstanding results. Figo is the second fastest car model in India to have crossed the 50,000 sales milestone and that is a reflection of the confidence our customers have in us and we will boost the morale further as we move forward” said Michael Boneham, president and managing director, Ford India. To engage other Figo owners, the “Figo four” shared personal road stories, photos, videos and experiences via their Facebook, Twitter and Orkut profiles and blogs. Customers and fans also followed the drive via Facebook (http://www.facebook.com/fordfigo), Orkut (http://bit.ly/orkutfigo), Twitter (http://twitter.com/fordfigo) and a Driving Ford blog (http://www.drivingford.in) and helped the couples out by posting valuable suggestions, advice and tips along the way. Seen as the success, the drive was successful in driving positive conversations around the brand and resulted in increasing Figo’s fan base on Facebook to over 15,000 people. Over 600 updates posted on the experiential drive and resulted in showcasing key Figo differentiators such as spaciousness, fuel economy and air conditioning from over 5,000 comments across social networking sites. “The response that we have got from this campaign has taken Figo’s popularity to a different level. We thank our online supporters also in this endeavour. Figo has been the top-selling vehicle in five out of seven months, since its launch and we wish to sustain this phenomenon.” Wark concluded.